Garrett Stubbs does not have any MLB stats for the season. Draft: 2015, Houston Astros, 8th rd. 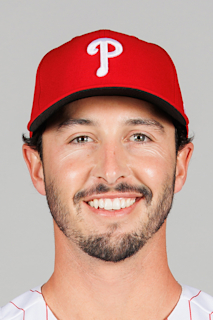 Is a 2011 graduate of Torrey Pines HS in San Diego, Ca...was a four-year letterwinner on the baseball team and received All-CIF San Diego honors twice in his career...also named All-North County and AllAvocado League First Team in his junior and senior seasons... Played four seasons at the University of Southern California from 2012-15...started his career with the Trojans in the outfield before becoming the program's everyday catcher...During his senior season in 2015, won the Johnny Bench Award as the top catcher in NCAA Division I baseball...batted .346 with 20 stolen bases and a .435 OBP, helping to lead the Trojans to their first NCAA regional berth in nine seasons (hit .563 during the regional)...was also named the Pac-12 Defensive Player of the Year and received First Team All-Pac 12 honors...recorded a caught stealing percentage of 52.8% (28CS/53ATT) on the year...Drafted by the Astros in the eighth round of the 2015 draft...signed by Astros scout Tim Costic...Was added to the Astros 40-mas roster this offseason...this will be his third straight Major League Spring Training, after spending the last two as an NRI...is signed to a one-year contract for the 2019 season. Spent his entire season at Triple A Fresno, where he was a Pacific Coast League All-Star...also named a MiLB.com Organization All-Star...hit .310 (92x297) with 19 doubles, six triples, four home runs, 38 RBI, six stolen bases, a .382 OBP, a .455 slugging and an .836 OPS in 84 games...played primarily catcher, making 74 starts, but also appeared as a DH (6g), right fielder (2g) and first baseman (1g)...was an NRI at Major League Spring Training for the second straight year, hitting .286 (8x28) with two doubles, one home run and five RBI in 17 games...hit his homer off Mets LHP Jason Vargas...reassigned to minor league camp on March 18...spent his entire minor league season with Fresno, missing just 11 days while on the DL from May 11-22...played in eight postseason games for the Grizzlies, hitting .269 (7x26) with a double, a home run and six RBI. Received Double A Texas League Midseason All-Star honors in a season where he also reached the Triple A level for the first time in his career... combined to bat .232 (79x340) with 18 doubles and a .328 on-base percentage between Fresno (23g) and Corpus Christi (75g)...posted a caught stealing percentage of 39.5% (15CS/38ATT) in his 64 games at catcher with the Hooks...ranked third in the Texas League in caught stealing percentage (min. 30 attempts). Was a California League Midseason All-Star and an MiLB.com Organization All-Star in a season split between Class A Advanced Lancaster (55g) and Double A Corpus Christi (31g)...hit .304 (99x326) with 22 doubles, one triple, 10 homers, 54 RBI, 15 steals and an .860 OPS (.391 OBP/.469 SLG) between the two levels...recorded a caught stealing percentage of 50.9% (27CS/53ATT) in 67 games at catcher between Corpus Christi and Lancaster...hit .328 (20x61) against left-handed pitching and .298 (79x265) against right-handed pitching...was highly efficient on the basepaths, recording 15 steals in 18 attempts (83.3 stolen base percentage)...began the season with Lancaster and ended up leading all California League catchers in caught stealing percentage (57.1%, 16CS/28ATT, min. 20 ATT)...batted .291 (60x206) with 19 extra-base hits, 38 RBI and an .827 OPS (.385 OBP/.442 SLG) in 55 games at the level...received a promotion to Double A at the beginning of July and improved upon his offensive numbers at Lancaster...hit .325 (39x120) with nine doubles, four homers and a .918 OPS (.401 OBP/.517 SLG) in 31 games with the Hooks...received Lancaster May Player of the Month honors and Corpus Christi July Player of the Month honors. Played in 36 games in the minors after getting drafted by Houston...hit .263 (31x118) with a .369 OBP between Class A Quad Cities (25g) and Class A Short Season Tri-City (11g)...threw out seven-of-nine (77.7%) attempting base stealers at Tri-City...posted a 55.6% caught stealing percentage (15CS/27ATT) between the two levels. March 9, 2019 Houston Astros optioned C Garrett Stubbs to Round Rock Express. November 20, 2018 Houston Astros selected the contract of C Garrett Stubbs from Round Rock Express. May 23, 2018 Garrett Stubbs roster status changed by Fresno Grizzlies. May 13, 2018 Fresno Grizzlies placed C Garrett Stubbs on the 7-day disabled list retroactive to May 11, 2018. January 25, 2018 Houston Astros invited non-roster C Garrett Stubbs to spring training. August 5, 2017 C Garrett Stubbs assigned to Fresno Grizzlies from Corpus Christi Hooks. April 23, 2017 Corpus Christi Hooks activated C Garrett Stubbs from the 7-day disabled list. April 17, 2017 Corpus Christi Hooks placed C Garrett Stubbs on the 7-day disabled list retroactive to April 14, 2017. January 13, 2017 Houston Astros invited non-roster C Garrett Stubbs to spring training. July 4, 2016 C Garrett Stubbs assigned to Corpus Christi Hooks from Lancaster JetHawks. May 4, 2016 Lancaster JetHawks activated C Garrett Stubbs from the 7-day disabled list. April 22, 2016 Lancaster JetHawks placed C Garrett Stubbs on the 7-day disabled list. April 5, 2016 C Garrett Stubbs assigned to Lancaster JetHawks from Quad Cities River Bandits. March 5, 2016 C Garrett Stubbs assigned to Houston Astros. July 16, 2015 C Garrett Stubbs assigned to Quad Cities River Bandits from Tri-City ValleyCats. June 19, 2015 C Garrett Stubbs assigned to Tri-City ValleyCats. June 18, 2015 Houston Astros signed C Garrett Stubbs.